We noticed this modern little building on a recent trip to Bartlesville, Oklahoma. 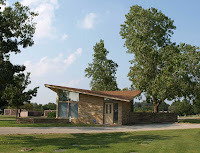 It's an office for the Memorial Cemetery located on Nowata Road. What caught my eye was the saddle roof (technically known as an hyperbolic paraboloid) more commonly found on Atomic Age churches and gas stations. It seemed like a rather unique feature for such a mundane little building. B'ville has quite a few unique modern buildings. Frank Lloyd Wright's prairie skyscraper, the Price Tower, being the best known. But there are many other less celebrated structures (see Miscellany from Bartlesville from March 6, 2008) that give this small city an architectural look and feel that's quite distinct. It's also interesting to note that Bartlesville was the home of Phillips 66 (now ConocoPhillips)- a company well known for space-age service stations featuring swooping roofs reminiscent of this design.